Facebook’s free live streaming services have opened up a world of opportunity for churches to reach out to their audience through live video content. Churches love the number of people who are able to watch their Facebook live videos, however, there are problems with accurately tracking the number of attendees. Often these numbers are even inflated and may rarely include new people, which can be bad news for churches. So what is this service actually providing and is it worth it? When watching TV, viewers may be on a channel for a few seconds only to decide the show is not what they want to see after all. Other viewers may get distracted while watching and never intend to actually watch the show that stays on the screen for those few seconds. On Facebook, those brief pauses are tracked as views under their “3-second video view” rule. In contrast, YouTube’s standard is reported to be “around 30 seconds,” although it’s not officially acknowledged like Facebook’s 3-second rule is. For example, if a church is tracking 1,000 views on its Facebook Live stream, it may seem like there are a lot of people watching online at that time. In truth, many of these viewers may just be scrolling past the church’s live-stream and scrolling slowly enough to accidentally get counted. Some churches have limited ministry resources and choosing between an in-person or a digital ministry event might be necessary. Carefully choosing between these options is especially important given what is known about Facebook live viewer tracking. The returns of an in-person event may seem more limited than doing a Facebook live event, but you could be making your choice based on bad information and wasting what you have. This is not the only Facebook problem to look out for either. Facebook also has a discovery problem. On their Go Live on Facebook page, they answer this question: “How can people discover live broadcasts on Facebook?” The problem here is that they are asking the wrong question. Facebook is answering the question of how your followers and friends find out that you are currently live on Facebook. But what if you want to find a live stream that you do not know about? It is possible to search on the new “Watch” page, but it is still not possible to discover live videos from people you have never heard about on the newsfeed. One tip is to try is to pay attention to how many live videos you see on Facebook this week from sources that you do not have any connection to. You might see a friend share one or two, but that will be the extent of it. That is really the only exception—when friends share live videos. Now take this one step further. How many live streams have you shared? Every one? Some? Only when you think about it? For most people sharing a live stream is the exception, not the rule. On most platforms, the way to get people to do things is to ask them nicely to do it. On Facebook, this is called “like-farming” and it is strongly discouraged. This leaves churches in a tough situation of not being able to reach out to new people unless your people share your church’s live-stream with them. BUT if your people share your live-stream, your church may be penalized and seen as a “like farmer” or spammer. From Facebook’s standpoint, this makes sense. You do not want people to share posts that were created just to get likes or traffic and also provide little real value. Or worse, this could be changed later to provide more traffic to things that the original “likers” did not intend. This is a case where the “law of unintended consequences” rears its ugly head. By discouraging creators from asking for likes and shares, they are limiting the signals they get that indicate which videos should be further promoted, keeping people on Facebook. They are also limiting discovery, so people are less likely to find things that will keep them on Facebook. Even so, there is a problem with getting your congregation to share your live videos on Facebook. Church attendees are already there in person. Unless you want to encourage attendees to get on their phones and share during the event or service, the very people (aka church members) who are most likely to share one stream videos on Facebook are not watching the live-stream, and thus cannot share it. There are other concerns that churches should have with Facebook’s live-streaming policies. Facebook has stopped live streams and banned churches from using music they have permission to use. And it isn’t just that their algorithm sometimes makes mistakes (like a recent Sunday when it incorrectly identified all countdown videos as being the property of the International Olympic Committee). These are all growing pain issues that could be solved by giving creators (including churches) a customer service person to talk to who has the power to change things. No, this policy aligns with Facebook’s ambition to not just be ON the internet but to BE the internet (for all intents and purposes), like the way AOL was for so many in the 1990s. Facebook wants people to get online, go to Facebook and never leave. So, while creators are not limited as to where they can live stream other than Facebook, live-streaming software, hardware, and hosts are limited. Some people combat this by using YouTube’s API, but then also doing an RTMP live stream to Facebook. Whether using OBS (open broadcaster software), a Teradek vidiu or a service like ChurchStreaming.tv or Boxcast, this means that what could easily be a “checkbox” option to live stream to multiple locations is simply not allowed. Sure, it is easy to get around, but it adds unnecessary complexity. Facebook wants to control what should be free. It feels like they are desperately trying to keep every last user it can, instead of providing something users want to stay for. It is a sad strategy and ultimately one that will not last. So what’s the best way to promote Church’s messages on Facebook or any social media without Facebook live? Best way? For Facebook, sad to say, but paid ads. They keep throttling organic reach and doing things to make sure that they don’t work the way you want. 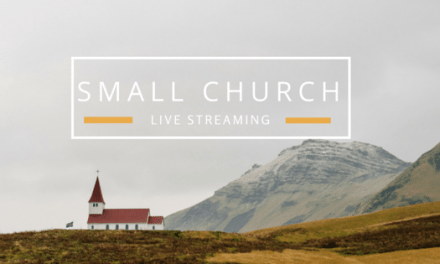 For youtube, live seems to still work to reach out to new people, but make sure your live-stream looks good, not just a “have someone hold a phone in the back of the congregation”, but something that looks like your really care about the message. Thumbnails matter, too. Work on those.